It was on a trip to Mexico after her father’s death that Beatriz Vasquez discovered the centuries-old Mexican craft that has become the vehicle for her art. Papel picado, which involves cutting designs into layers of thin tissue paper, goes back to pre-Hispanic Mexico and is still used for events like weddings, baptisms and other festivals or ceremonies. “It’s very disposable, and nobody really sees it as a fine art,” said the 49-year-Vasquez, who has a year-long fellowship with Root Division, where she teaches. And she has a residency at The Growlery, where artists live and work, rent-free, in a restored Victorian-era home. 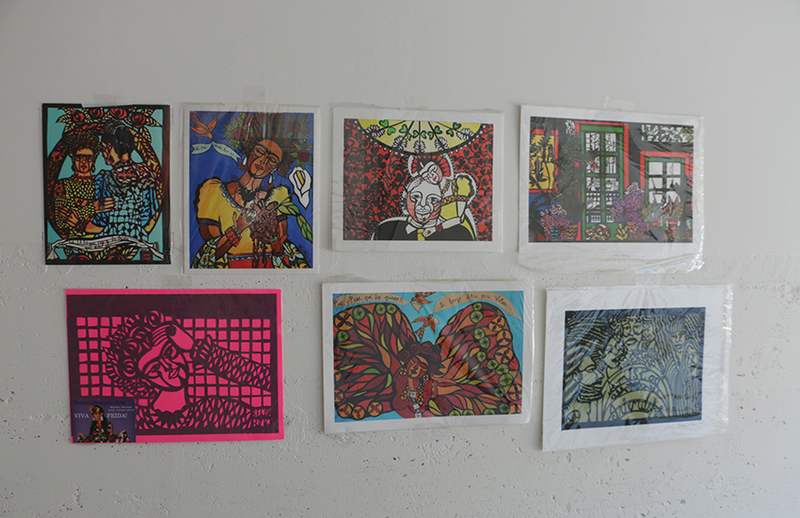 During her trip to Mexico, Vasquez researched the craft and began to see papel picado as a metaphor for the indigenous women she was interviewing. 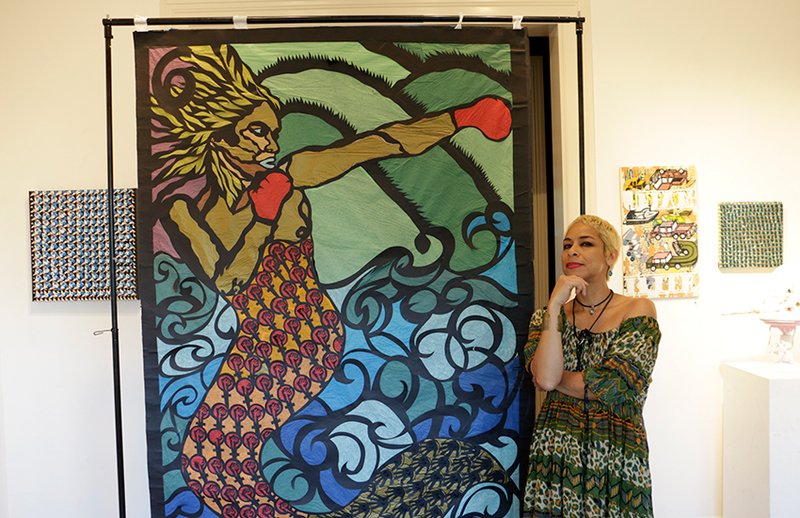 Her pieces are generally large — sometimes seven feet tall — and depict her experiences with politics, self-expression and her Mexican culture. In her work, there are intricate cuts of skeletons, butterflies and pineapples. One piece, La Sirena Feminista, tackles the topic of machismo in the Latino community. The work, created in 2015, is based on a traditional Mexican card game known as the Lotería. The face of la Sirena is that of Beatriz. Beatriz Vasquez works on a 10-foot papel picado banner that she is creating for the University of California, Santa Cruz. Photo by Luis Hernandez. I always wanted to give La Sirena a voice, she said. She sees women as the stronger gender, the gender that takes care of everything and makes everything grow. While she grew up in Brownsville, Texas, along the Mexican border, her family moved to Indianapolis when she turned 18. She ended up studying there, at the Herron School of Art and Design. The difference between San Francisco and Indianapolis, a much more conservative city, has been liberating. “For me, it’s extremely important to connect to my culture,” Vasquez. Vasquez is currently working on a piece for Ambassador Maria Brewer from Sierra Leone, Africa, and on pieces for an exhibition at The Growlery in January. That exhibition will be a tribute to water. Her work has also been shown locally at SomArts Dia de Muertos, Brava Theater and Root Division. Viewers can also get in touch with Vasquez through Root Division. Vasquez has many inspirations for her artwork, one of them being the Mexican artist Frida Kahlo. She stresses the importance of Mexican artists in her life and says they connect her to her culture. Photo by Luis Hernandez.